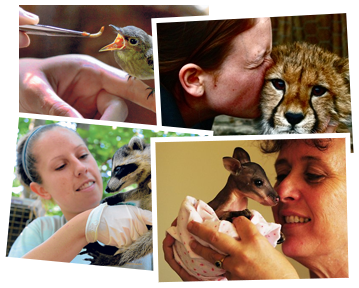 We're here to rescue, rehabilitate and return orphaned and injured wildlife to the wild. Recently released these bunnies just couldn't resist a bite to eat before hopping off into the woods. Orphaned Racoons currently in our care. After alleviating some minor dehydration, they are doing well! July 25, 2014 we released 6 Eastern Cottontail Rabbits after a few weeks of rehabilitation. They were found abandoned in a backyard at 10 days old. At about 1 month old most cottontails will leave the nest and be on their own. They couldn't resist a bite to eat before hopping off into the woods. Wildlife Rescue, or Do you Need ASsistance? Join now to receive updates, upcoming events, and success stories on the wildlife that's been rehabilitated. The Moraine Ridge Wildlife Rehab. Center is a 501 (c) 3 not-for-profit organization dedicated to improving the health of native wildlife.